Planner for Cobb County, followed her. committed themselves to historic preservation. involved in the Historic Preservation Division. A more detailed version of the information is in the Staff Directory on the Georgia DNR, Historic Preservation Division website. We learned a lot about the CLG Program. There is a great flyer about the CLG program on line. roadmap to success at http://georgiashpo.org/community/hpo. learned the program does nothing about the insides of the building or a building’s use. Cobb County and there are a lot of them. available at the Cobb County Community Development Agency webpages, http://comdev.cobbcountyga.gov/historic-markers/driving-tour.htm. to begin my historical driving tour of the county. Again, I think Smyrna should pursue becoming a Certified Local Government. The process will help the city define more sites that are truly historic and might even bump up our number of historic sites on the driving tour from a paltry three locations. Author Don TaylorPosted on December 16, 2012 September 10, 2016 Categories UncategorizedTags Certified Local Government, Cobb County, Driving Tour, Historic Preservation, SHGSLeave a comment on Smyrna Historic Preservation? Hannah McAllister was born in England on 15 August 1886. She was the fourth of six children- four boys and two girls. At the time of her birth, her father, Peter, was probably in the United States establishing himself and preparing the way for his wife and children to come to the States. By 1889, Hannah’s mother and siblings joined her father in Catasauqua, Lehigh County, Pennsylvania. By 1900, the entire family moved to Pittsburgh. Sometime in 1905, she met Rufus Darling. She was eighteen and he was forty-seven. In March of 1906, they had a daughter, Elizabeth Grace Darling. Family history states that there was a rift between Hannah and her father. Certainly, a granddaughter born out of wedlock from a man more than twice the age of his daughter could cause such a rift. It appears that Rufus and Hannah kept separate households during that time, he in Chicago and Hannah in Wheeling, West Virginia. In December of 1906, Hannah became pregnant a second time. This time Rufus married her, so on 16 February 1907 Hannah and Rufus were married in Kittanning, Armstrong County, Pennsylvania, a small town about 40 miles northeast of Pittsburgh on the Allegheny River. Family history indicates that she changed her name from Hannah to Anna so that she would be “A. Darling” and became known as Anna after that. An interesting side note is that Elizabeth appears to have modified a copy of the Marriage Certificate to indicate that Hannah and Rufus were married in 1905, thus legitimizing her. Family history indicates that this may have been a cause of disagreement between her and cousin Katherine Lane. In August of 1907, their son, Robert Harry Darling, was born in New Kensington (about 20 miles northeast of Pittsburgh on the Allegheny River), Pennsylvania. 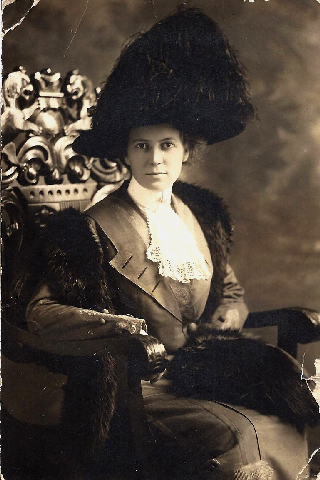 In 1910, Anna was living with her two children, Elizabeth and Robert, as a roomer at the home of Robert & Emma Hennig at 2219 Ward Street (Ward 4). Anna and Rufus divorced by 1911 after which she married Thomas White. Anna died on 15 July 1913 at the age of 26. Family memory holds that Hannah was buried where Thomas White was later buried at Chartiers Cemetery. At her death, her name was recorded as Annie White. After the success I had with my Y-DNA test, my wife was excited to find what she could. I explained to her that we could only do a mitochondrial test on her. It would give a broad brushstroke of her maternal line; we knew that her great-grandmother emigrated from Switzerland around 1903 and not much more. She was interested in her paternal side; family tradition held they come from Wales, however, there was no proof? Anyway, we convinced her brother to take the test. Mother was a little upset and concerned. She thought we were accusing her of a dalliance with the milkman and questioning her virtue. We finally convinced her that we were only looking for what we might find several generations in the past. Brother Jerome took the test and after what seemed an interminable amount of time, the results came back — Haplogroup I1, what Ancestry calls “The Stonemasons.” It is sort of an odd combination of Scandinavians and Mediterranean people. The map Ancestry provides shows the people coming out of Africa, to Scandinavia, then to the Mediterranean, and then back to Scandinavia. All that is well and good, but the real purpose of taking the test is to find a close match – and there was. A person with the same last name showed up with a most recent common ancestor (MRCA) in only six generations. So the search was on, for the common ancestor. Unfortunately, it was not an easy task. The tree I have for my wife’s line traces ancestors into the early 1800s. The cousin’s tree goes back to the mid 1700s. Ancestors from both trees (Jerome’s and the match’s) were in Virginia in the early 1800s. I found no matches between the trees on first names though. I worked on pushing my wife’s family history back another generation. I do not have a name for sure yet, but I am getting close. A couple more bits of information to sort out and assure which one of several Howell family heads is my wife’s 4th great-grandfather. What I do know is. He had at least four children, a girl and three boys. The daughter married (1819-1820) a man whose last name was “Holman” and they moved to Alabama about 1821. We know Mr. Howell was not religious, so he is unlikely to show up in any bibles or church records. Trying to track him down among all of the Howells in the Virginia counties during the times is grueling work. However, once I find that common ancestor, I will have a whole new tree of descendants to explore. The cousin does not appear to have anyone in his tree that died in 1817. I have looked carefully at the match’s tree and our tree and there is not a possibility for a common ancestor in seven generations on his tree and six generations on our tree. I have not been particularly pleased with the MRCA generation suggestion by Ancestry. In the cases where I have been able to trace back the number of generations suggested, none of them have been verifiable. Admittedly, it is only three connections, but I expect an 87.5% likelihood of a match within the suggested MRCA generations. I guess her family is n that remaining 12.5%. I will see what turns up when I have another DNA hit.